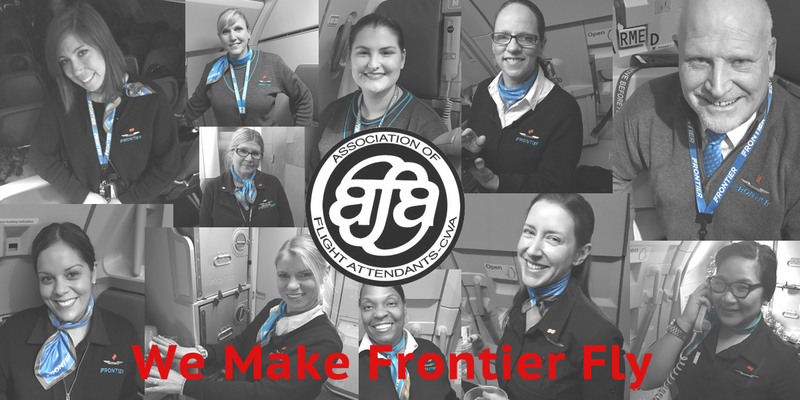 October 7, 2018 Frontier Flight Attendants will finally get our Calendar Day Off in Base!!! The company, through the threat of arbitration, has finally agreed to honor the contract language that states every 7th day we get to come home for a full calendar day off. May 8, 2018 Cabin Odor Events - A Message from AFA Frontier Safety Flight Attendants and Pilots have reported an increase number of odor events through ASAP and Incident Reports. AFA has been working with the company to identify the cause and work on preventative procedures to help eliminate these events. Welcome Aboard Flight Attendants!!! Frontier Airlines Inflight and our Union AFA maintains cabin seat agreements with other airlines, if you are commuting to and from work or just traveling for pleasure. It’s a privilege to have these perks with our airline partners and certain guidelines must be followed. Helpful information if you have an On the Job Injury If you are injured on the job, who should you contact? Call the Inflight (303)342-7707(303)342-7707 to report your injury. Dear Flight Attendants: We understand that many of you are under the care of a physician for various medical conditions. We are asking that each of you print out this paragraph and keep on you at all times and be ready to fax to the Medical Review Officer if you take a random drug test and it comes back as a negative-safety result. Attendees: Dani, Chris, Lisa and Kim. Drug Policy and Testing DOT is enforcing the five (5) panel drug screen, additional random testing is expected in domicile and outstations. Drug testing accomplished by testing a urine specimen.